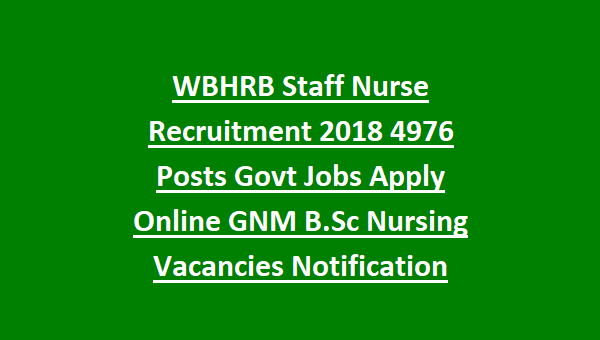 of 4976 Staff Nurse Grade II of West Bengal Health Recruitment Board. Only female candidates are eligible for this Staff Nurse posts. Online registration for this WBHRB Staff Nurse Grade II recruitment will be closed on 26-09-2018 before 08:00 PM. 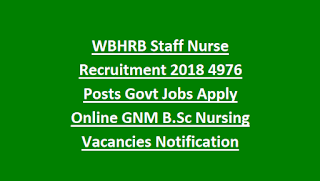 This WBHRB Staff Nurse vacancies Recruitment is completely temporary basis only. But there is a chance of renewal later depends upon the requirement. Selection for Staff Nurse Jobs of WBHRB is depends upon the received applications. If more applications received then a written test will be conducted or interview will be conducted. These vacancies are for the GNM Diploma Completed candidates, Basic B.SC Nursing and Post Basic Nursing Completed candidates. As on 01-01-2018 age limits for Staff Nurse WBHRB Recruitment is 18 to 39 years. Age relaxation 5 years for SC/ST, 3 years for BC candidates of West Bengal and for Physical disability candidates upper age limit is 45 years. Candidates must have qualified the General Nursing & Midwifery or Basic B. Sc Nursing Degree or Post B. Sc Nursing Degree from any Nursing Training School or college which is recognized by both of any state and Indian Nursing council. The candidates must have known Bengali/Nepali written and speaking skills. The selection for WB Staff Nurse will be held based receiving applications. If applications are received large number there is a preliminary written examination will be conducted. Otherwise personal interview will be conducted followed by certificates verification. For SC/ST and Physical ability candidates there is no application fee. After paying the application fee the candidate has login to the West Bengal Health Recruitment Board Website at www.wbhrb.in to submit the application. Click here to apply online for West Bengal Staff Nurse Posts Recruitment 2018. The Eligible candidates can apply through online only. Before applying online must have read the user instructions and official advertisement of WBHRB. The candidates has to pay the application fee through offline only at bank. And must have update the fee paid details in online, otherwise it will be treated as in complete applications and it will be rejected automatically. Last date for registration is 26-09-2018. Please share this recruitment notification of West Bengal Health Recruitment Board Staff Nurse Grade II Posts to your beloved friends through social networking sites.